(Call 1-800-lakes 11 for current lake levels). Looking down, you can see 10-20 feet deep to the bottom of the lake, when fishing or navigating the lower end of Lake Martin’s very clear water. 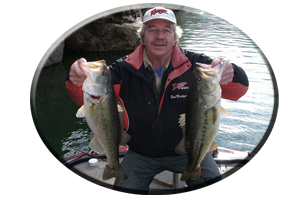 Deep, clear water and very skittish bass in shallow water, all go together, and often calls for applying deep water tactics, on the lakes lower end. 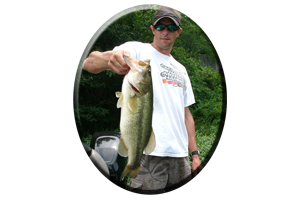 This may call for downsizing your tackle and your choice of offerings for both spotted bass and largemouth bass. 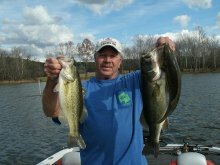 Or resulting to night fishing, like most Lake Martin regulars, can show some of these bigger bass species foraging, unmolested, in the shallows. Also at night, gone are the dozens of recreational water vessels, this lake is known for displaying during the day, throughout the summer months. Although just as clear as the main lake waters, some creeks on the lakes lower end deserve some exploring, whether you day or night fish, this summer on Lake Martin. Starting at Lake Martin dam is rather deceiving, especially when not familiar with the lake. You may not be able to even tell which direction is upriver, without a map or compass. When these necessities are obtained, you will see a massive feeder creek, Kowaliga Creek heading off toward your left, heading in a Northwesterly direction. This huge creek also has many smaller creeks that branch off. After going under Hwy.63 bridge (that crosses the creek about 5 miles from the dam), you will see Little Kowaliga Creek. It will immediately branch off to your left, if heading upstream, after going under the bridge. If taking the right fork, after going under the bridge, you will be heading up Kowaliga Creek and you will see Parkers Creek, branch off to your left. This is about 4 miles from the bridge, heading Northwest. Proceeding straight (after going under the bridge) will take you to another side creek, Pike Creek. Also a few more miles, from Pike Creek, will show the headwaters of Kowaliga Creek. This entire Creek has brush piles put out by residents, found around piers, boat houses, marinas and along main creek flats. There is an abundance of rocky banks, big boulders, rock bluffs, sandy banks and plenty of main creek points and islands for bass to relate to, and for anglers to target, for both day and night fishing Kowaliga Creek this summer. If leaving the lower lakes dam and heading exactly due North for about 5-6 miles (after passing 4-5 islands), you will see a small, narrow opening. Unknown to many newcomers, without a quality map, this leads to the mid-to-upriver portion of the lake. If leaving the dam and going about 4 miles, you will see a huge creek off to your right, due east. This is Blue Creek. It branches off to several smaller creeks and is crossed in its headwaters by Hwy. 49 bridge. It, like Kowaliga Creek, shows very clear water and has many piers, boat houses, and rocky banks. When fishing or just boating, this midlake region has shown many boat occupants, lost in years past. Like mentioned, a map of the lake and a good compass, can help you avoid asking for directions on Lake Martin. Especially for first timers, when attempting to learn this huge, sprawled out impoundment. Although its only 17 miles from Lake Martin dam to the famed, mid lake region of Wind Creek, more people get lost here, in the mid lake, than anywhere else on the lake. Small islands, narrow, main lake openings and many, small to large islands, adorn this midlake section. If not looking back, you may not even remember which direction you came from, because it all looks the same. There are also some big feeder creeks to get lost in as well. Some creeks are so big, you will think you are still on the main lake, when navigating blindly. Sandy Creek, Manoy Creek and Dennis Creek, will all be on your right, if navigating upstream. Only a smaller Creek will be found on your left. Perue Creek. It actually looks more like a deep pocket, than a creek. Right in the middle of the lake are two islands. Woods Island and smaller, Youngs Island. Heading north, navigating right up the middle of these two islands, will take you to the upper lake region and Wind Creek about 5 miles ahead, on your left. From Wind Creek State Park to the lakes headwaters, is about 30 miles of twisting, turning river channel. This famous state park is home to many bass tournaments, held each week. 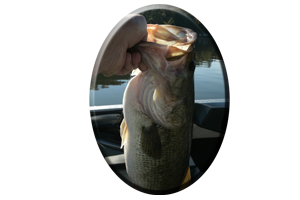 Hundreds of quality sized spotted bass and some big largemouth bass, are released here each week. 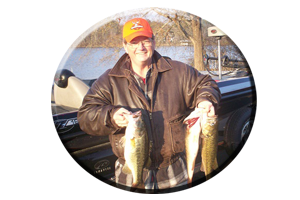 These bass have no reason to leave, with plenty of baitfish and fish holding cover. Rocks, wood cover such as stumps, trees and brush piles, including points, islands and bottom irregularities, all show bass of both species very catchable in this release site area. There is also a lot of brush piles planted in the Wind Creek area, all the way above Hwy. 280 bridge that crosses the lake, upriver from here. These brush piles may have several Christmas trees tied together, anchored in one spot. Put out around the first week of each new year by the Alabama Power company for fish habitat. These brush piles are excellent choices for fishing in water from 10-20 feet deep this summer. They are easily identifiable, marked by a blue, floating styrofoam buoy. Although the lake narrows from Wind Creek State Park to the lakes headwaters, to a very small, more river-type terrain, there are still many creeks and flats to fish, both day and night, this summer. Just above Wind Creek, on the lakes Western side is very famous Elkahatchee Creek. Many major bass tournaments have been won in this feeder creek. It is rather featureless, with only sparse wood cover, and a winding creek channel, bordered by rocky points and small pockets. Elkahatchee contains quality sized bass for the knowledgeable angler to fool. Heading upriver, it is obvious the lake begins to narrow, just before Hwy.280 bridge comes into sight. Just past this main lake bridge (on your right), is Sturdivant Creek. Not a big Creek, but it does contain bass habitat. Piers, boat houses, roadbeds, rocky points and laydowns, stumps and brush filled flats in the back of this creek, all make Sturdivant Creek, an excellent place to fish day or night, for both spotted bass and largemouth’s this summer. Above Hwy. 280 bridge is a railroad bridge that spans the lake. Studying a map you will see the main river channel swings off far to the right, after going under this second bridge. A huge island here, sits right in the mouth of Britt Creek. Continuing north you will see rock bluffs, laying trees and logs on main lake flats, and on your left (about 4 miles above the bridge), is Coley Creek. Both of these creeks have an abundance of rocky banks, wood cover, and points and islands. About 5 miles upriver from Coley Creek the lake narrows. After passing two creeks on your left, Hilabee Creek and Timbergut Creek, you will see a few small islands covered with logjams, especially on the upper ends. From here, to the lakes headwaters (about 2 miles) is filled with rocks and boulders. Navigating requires extreme caution, idling is suggested, from here to the incoming white water ahead. * Looking to visit Lake Martin soon? Always call on Reeds Guide Service…first! 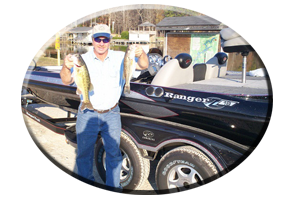 ” Serving anglers that visit or have lived on Lake Martin (and other Alabama lakes) for over 30 years.” Several professional guides and boats available year round for multiple parties and corporate guided trips. Discounts available. Remember, a guided fishing trip with Reeds Guide Service makes a great Birthday gift, Christmas gift, Father’s Day gift or any occasion, for those loved ones that love to fish!